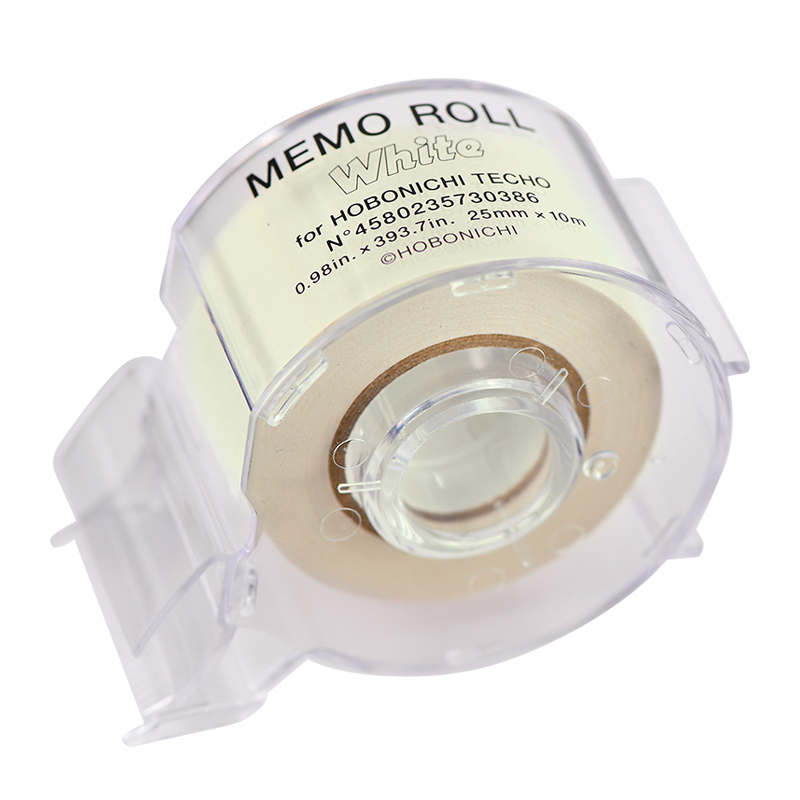 This roll of white paper tape features removable adhesive. You can cut strips to your desired length to maximize the usage for these handy little sticky notes. The clear holder allows you to see how much you have left. The Memo Roll is a long-time favorite of Naomi Hirabayashi, the designer who worked with us on the 2018 techo covers Travel (Chocolate) and Travel (Smooth Leather). To commemorate the new addition to our lineup, Hirabayashi has redesigned the holder. Refills are available in three colors, White, Yellow and Rose. Born in Tokyo. Joined Shiseido after graduating Musashino Art University with a degree in Design. Spent a year in London design studio MadeThought in 2002 and after returning to Japan embarked on a freelance career in Art Direction and Graphic Designin 2005. Main products include art direction for companies (marunouchi) HOUSE, la kagu, and UNITED ARROWS. Designed packaging for HOPE and NTT DOCOMO, and designed CD jackets for Akiko Yano, Hikaru Utada, DREAMS COME TRUE, and more. Provided art directionfor magazine Ginza. Won many awards for her work, including the JAGDA New Designer Award, the ADC Award, the NY ADC Gold award, the British D&AD award, and more. Cutter blade: W: 75 x H: 60 x T: 35 mm / W: 2.9" x H: 2.4" x T: 1.4"
In order to provide you with the most satisfaction for your product, we've compiled a list of warnings, potential issues, and tips to keep in mind for this particular product. Please be sure to read this information carefully before placing your order. Applying this product to a surface with printed material or writings in pencil may result in transfers onto the product. Certain surfaces may also be affected by the adhesive, resulting in damage or glue residue. Applying this product to thermal paper, carbonless copy paper, or other paper with special properties may cause the writing or print to disappear, or leave behind glue residue. Depending on the material product is applied to, adhesive may weaken over repeated use. Please remove gently to prevent adhesive from staying behind. Certain inks and writing materials may smear, leak through, or take longer to dry.